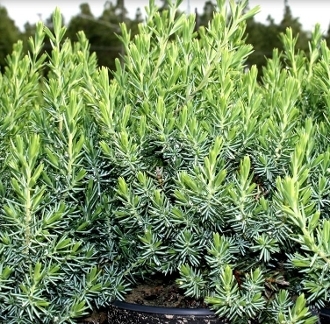 This popular, fast-growing evergreen maintains its dense, ocean blue-green foliage year-round. Its needles are dense and shorter than other junipers with a low-trailing growth habit spreading 2-3 feet (6 inches tall). Best performs as groundcover, seashore planting, planter boxes, and draped over walls. This easy-to-grow evergreen needs a regular water schedule to ensure the growth of a mature root system. After the mature root system is established, watering is needed occasionally, except during a drought, watering is needed regularly. Prune once or twice a year around the edges in order to keep the middle of the plant full.